By Chelsea Sheeler, D.O., Rocky Saenz, D.O. A young adult patient presented with continued pain following an ankle injury despite conservative management. Radiograph of the left ankle (A) demonstrates a cortical defect with separation of an osseous fragment from the lateral talar dome (arrow). 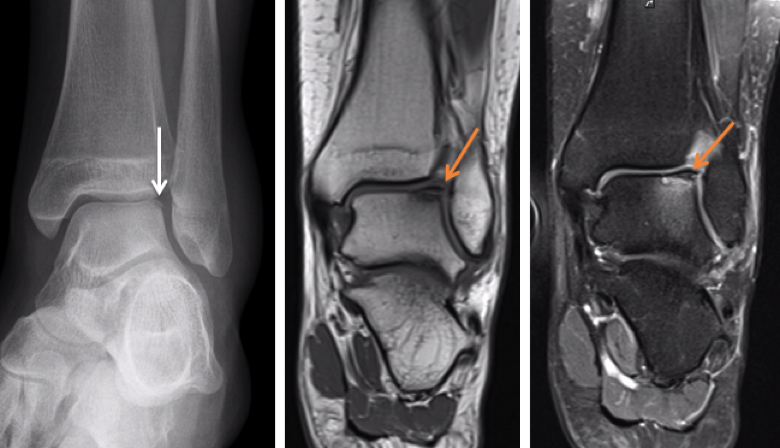 Coronal T1 (B) and proton density (PD) with fat suppression (C) images show the focal defect (arrows) with associated low T1 signal and high signal on PD between the articular cartilage and subchondral bone. Rosenberg ZS, Beltran J, Bencardino JT. MR imaging of the ankle and foot. RadioGraphics 2000; 20:S153-179. At the Viewbox: Osteochondral Defect, Unstable. J Am Osteopath Coll Radiol. Chelsea Sheeler, D.O., Rocky Saenz, D.O. Dr. Sheeler and Dr. Saenz are with the Department of Radiology, Botsford Hospital, Farmington Hills, MI.